There is a full programme of South of Scotland League matches scheduled to be played this Saturday weather permitting. 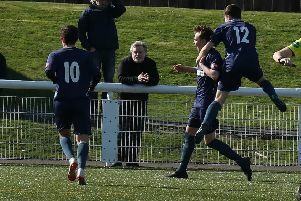 League leaders St Cuthbert Wanderers have a potential banana skin contest against Mid-Annandale at Lockerbie with Mids being a bit unpredictable this season but turning in some good results at times. Saints will go into the match as favourites to maintain their good run of form but the home side are more than capable of holding their own and with a bit of luck could take a share of the points. Second placed Newton Stewart have a home match against Nithsdale Wanderers and this is another match which could hold potential danger for the title challengers with Nithsdale quite capable of turning on the style if they can produce the good form that sometimes eludes them. The Creesiders though are still unbeaten this season so far in the League and although under the new management of James MacLeod and Ian Thomson they will be keen not to drop any points in this match to maintain their challenge for this seasons title. The present champions Wigtown and Bladnoch will be looking to take the three points in their match against Fleet Star at Trammondford Park as they attempt to retain the title and although Star are having a very good season by previous standards the home side should take points from this encounter. Abbey Vale have Edusport Academy as their visitors to New Abbey for a match the visitors will go into as favourites to take the three points from. Vale though will see this as a match that if they strike the form that they have shown on occasions this season then they can take something from it although as always much depends on what playing personnel Edu turn out from their large squad of players. Crichton play hosts to Upper Annandale in Dumfries and this is a match that looks as if it could go either way with both teams more than capable of taking the full three points. Home advantage for Crichton however may be the deciding factor. There is a local derby at Maxwelltown High School where Lochar Thistle lock horns with Heston Rovers in another match that could go close. There does not appear to be much between these two teams and a share of the points is a distinct possibility. Bottom placed Dumfries YMCA entertain second bottom Creetown in Dumfries and the pointless home side would look to be in for another defeat with Creetown looking the stronger of the two sides. YMCA have lost almost 100 goals more than Creetown this season in the league and this figure could be even larger following this contest. The fixtures scheduled to be played last weekend were all South of Scotland League matches but all were postponed due to the weather except the contest at St Mary’s Park, Kirkcudbright which went ahead with St Cuthbert Wanderers beating Dumfries YMCA 9-1. However the players and committee at YMCA have to be commended at the way they manage to turn out week in and week out and will surely be rewarded for their endeavours sometime soon with a victory.